You would never be fooled into thinking that you were walking along the shore of Tidal Basin in Washington, D.C. or in picnicking in the hanami style in Kyoto but on a crisp spring day with a brilliant blue sky in Toronto, many were marvelling at the sights and smells of 70 cherry trees with heavily laden pure white blossoms. And, lucky for you, I was among them! Fortunately for the good citizens of Toronto and few University of Toronto undergrads who notice, the Consulate General of Japan donated these and many other flowering cherry trees through the Sakura Project to grace a formerly non-descript pathway. I was on my way to Chinatown with my son for dinner when these "floating clouds" mesmerized me. Knowing how fleeting the scene is and how short-lived the blooms are, I was compelled to return and take many photos. The path runs diagonally and bisects two roughly triangular pieces of lawn and is beside the University of Toronto's Robarts Library. It is a perfect site for an allee but what types of trees would be suitable? As you know by now, I'm an unrepentant ornamentalist so with the usual caveats of ornamental cherries being short-lived, pest and disease magnets out of the way, of course something beautiful had to be planted! Above is the view looking south-east. The monster library is situated on the left. Won't this be incredible once the canopy entwines? Not only was I knocked out by the sheer number of flowers but there was a noticeable scent as well. Bees were everywhere! I wonder where their hives are amid the concrete and asphalt of downtown life? You can imagine that before these trees were planted, this was more or less a runway strip. You just kept your eyes on the ground and bore right through getting to class! Well, I did anyway. While not every tree had this example of smooth and shiny bark, I wanted to show you another beautiful and under-appreciated aspect of Prunus. This was above the graft and, in fact, all the root stocks had a dull gray matte look to their trunks. This picture juxtaposes the natural ornamental foreground of the cherry branches with the library in the background. 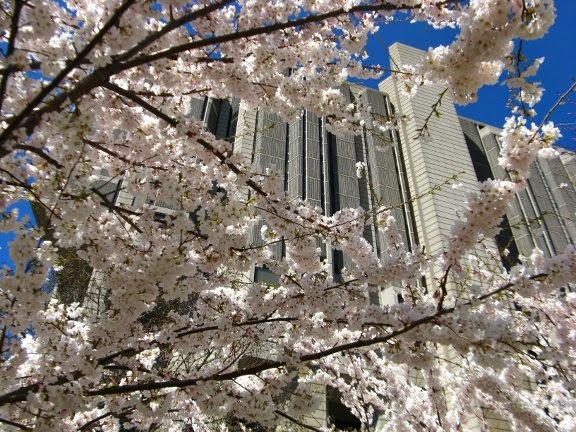 I don't know whether the students call the John P. Robarts Research Library "Fort Book" today but when I was a grad student, oh, 20 years ago, I practically lived in the stacks of this imposing and unfriendly-looking structure. The cherries try their best to humanize the space and for a couple of weeks out of the year, they do indeed! 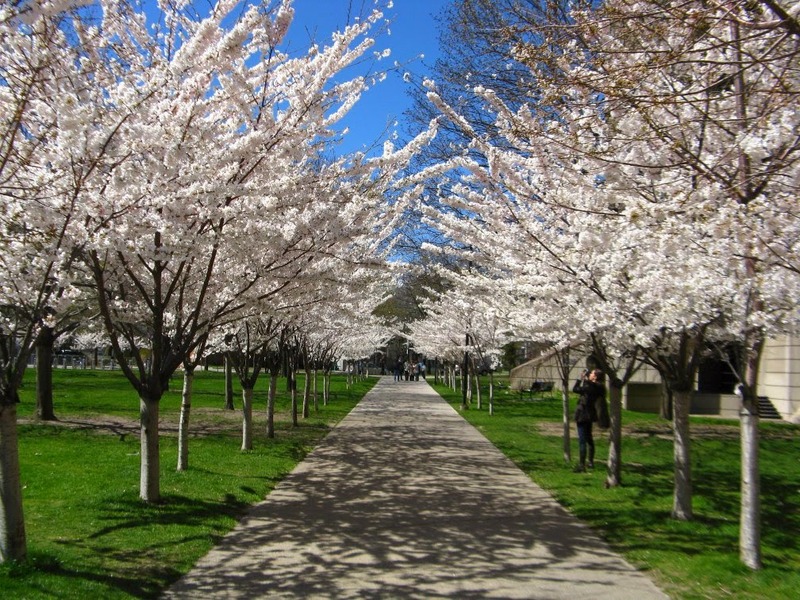 Click here for prominent Japanese Flowering Cherry planting sites in the City of Toronto for the Sakura Project. Z radością taką piękną, wiśniową alejką bym poszła na spacer.Widoki wspaniałe. Pozdrawiam. We are happy to have such a beautiful, cherry avenue I went for a walk. Wonderful views. Yours. it's a beautiful path to walk around and under, you can't help but smell the blooms, see the bees, and appreciate the snow-white flowers! I do not think I ever noticed this the whole time I lived in Toronto, can't believe it! I planted an allee myself a few years ago, of amelanchiers. As they are native they should be fairly disease resistant and very hardy, can't wait until they meet at the top and sides and form a tunnel. I think the plantings have been at the St. George site since 2005 and, of course, super-stunning at this time of the year. A serviceberry allee would also be lovely with spring flowers and great fall foliage, nice idea. The cherries are just a little bit later here in Oakville, although did notice a lovely old tree a few properties away. So tempted to climb over the fence to have a peek. If I have a moment, will go out to the RBG - their collection of early cherries is wonderful. with such a mild winter, we have amazing cherry/plum/pear shows right now. Maybe you'll do a post about the RBG's cherries soon.